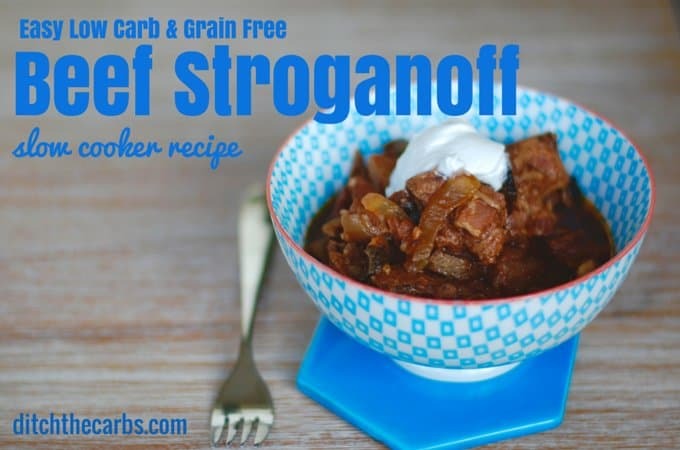 Low Carb Beef Stroganoff - in the slow cooker. 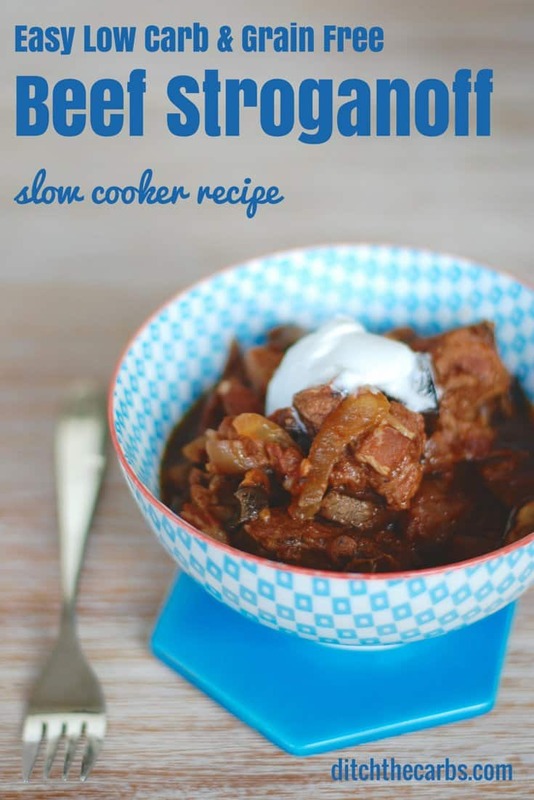 This low carb beef stroganoff, using the slow cooker, ticks all the boxes. Fast to prepare, low carb, cooks all day, tender, incredibly tasty, uses stewing steak rather than fillet steak, easy. If you have a busy day and want something to come home to, this is the one. Walk in the door late at night, and the smell of low carb beef stroganoff welcomes you. Beef stroganoff is traditionally served with pasta, but rather than that stodgy filler which adds zero nutrition, serve with vegetables. We have ours with sliced green beans, broccoli and cauliflower. By giving up pasta, you cut your carbohydrate intake and double (or even triple) your veggies. Add sour cream or cream cheese to the low carb beef stroganoff before serving, and place the sour cream/cream cheese on the table for the vegetables too. Sprinkle with parsley. Many cookbooks instruct to pre-brown the onions, garlic and meat before adding to the slow cooker. I have found it makes very little difference. I do it the cheats way and just place all the ingredients in the slow cooker and stir. I have tried both methods, and really there is little to gain, but you save at least half an hour of preparation and cleaning up dishes. If you have a busy day and won’t be in until late, you want the easiest meal possible. I’m also guessing on such a busy day, there are other things you would rather be doing than frying onions, garlic and meat in the morning. Slow cooker low carb beef stroganoff can be put on in the morning and it will be ready when you come home. Place all the ingredients in the slow cooker. Set on LOW for 6-8 hours or HIGH 4-6 hours. Serve with sour cream (optional). To make the recipe dairy-free and Paleo, simply omit the sour cream. While this recipe is very good, it s not a stroganoff. Stroganoff has a white, creamy sauce. No tomatoes. Im just curious where the sugar comes from? There will be some naturally occurring sugars in the mushrooms and sour cream. I made this today … it was delicious!!! … thanks so much. I know this recipe serves 6, but what is the size of each serving? I wasn’t expecting much from this recipe because of the simple ingredients, but I’ve made it today and it was absolutely amazing. I added a couple of chopped carrots because I’m OK with slightly more carbs. There was a bit to much liquid once cooked so I strained it off and reduced it in a separate pan before adding back. You were also right about putting the ingredients straight in without browning first. It didn’t make any difference whatsoever and was bursting with flavour. For anyone reading this, I definitely recommend topping it with sour cream as suggested in the recipe. It takes it to another level. Anyway, just wanted to say thank you for sharing. This recipe is going to be one of my regular dishes from now on. Thanks Martin, I love your low expectations for my recipe 😉 but I’m glad you loved it. And yes, the sour cream takes it to another level, otherwise it’s a beef and mushroom goulash! Have you tried making this with bone broth instead of stock? This recipe is sensational! Have just made it for a cold Winter’s day in Victoria, and it is absolutely delish!! Thank you for posting this. Keen now to try some of your other recipes!! Made this tonight and it’s superb. Works great in an electric pressure cooker as a last minute meal, too! Use the brown function, start with the bacon, add onions and garlic. Add in the rest of your ingredients, except sour cream, then cook at regular pressure for 30 minutes. Does the calorie/fat count include the sour cream /cream cheese? No as I have seen the huge variation of how much sour cream some people add to their stroganoff. From a homeopathic dose, to almost entirely topped in sour cream. Hi!! I’m new to your website (I found you through your instagram page) and I am beyond excited to try these recipes!! 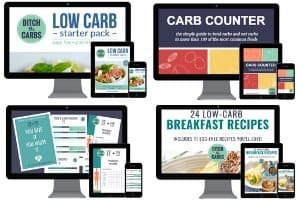 I’ve always been ‘carb sensitive” and have tried many low carb recipes that just don’t work. I’m especially excited to try the Fathead recipe for pizza and nacho chips. What a wonderful base for other recipes as well! Thanks for all the wonderful content and I’ll be sure to come back and let you know how my experiments turn out!!! how does this hold up when frozen after preparing? i want to make a large batch then freeze individual servings for quick dinners. thanks! Freeze individual portions, defrost as you require them and reheat thoroughly. I would reserve adding the sour cream until after it has been reheated. It might make the sauce split if reheating with the sour cream already mixed in. I want to make the strogonoff but dont have smoked paprika? Even plain paprika would do the trick. I think others may call it a white onion in the states. We call it brown because it has a brown skin. No, the yellow onion has a brown skin. The white onion has white skin. You prob meant yellow. Does any liquid go into this. Yes, the recipe calls for 250ml (1 cup) beef stock. Is the bacon just actual Bacon? Yes, any bacon would do. It adds a lovely smokey flavour to the low carb beef stroganoff. 😊 What we call bacon in the US is called streaky bacon in the UK. What they call bacon, we call Canadian bacon. I read an article about this, they have even more types of “bacon”, but you get the idea. I totally cheat and use ground beef for my stroganoff. Not sure it would hold up to the crock pot. This has made our line up for next week. Would love to make this but don’t have a slow cooker. Is it do-able somehow in a regular oven? Absolutely. Jus pop it in the oven at 180c/350F for an hour. Or you could use better steak (not stewing steak) and cook on the stove top for 45 minutes simmering away. You can put all the ingredients in a pot in a slow oven (225-250F) for 5-8 hours. If you have a timer on the oven, freeze all the ingredients and put them in the pot frozen and set the timer to start so that your dinner will be finished when you get home. This works for pot roast, too. What is the general serving size. You could actually omit it, or possibly add some stock for added flavour and depth. I made this last night and the whole family thought it was yummy, even my nine year-old who doesn’t like stews! I think it was the cream cheese that swung it for him, and the sour cream that swung it for us – that definitely gave it an extra something and we loved it. Looking forward to the leftovers today and making it again soon! What does the “c” denote in “1/4 c tomato paste? Cup. Take a look at my conversion charts also. Sounds delicious and perfect for these cooler months. I’ll be giving it a go soon! Thanks Lisa. I’ve got the slow cooker on as I type, and will be loading more winter warmers soon.